-The question is simple: why is the SPL response of a loudspeaker so different from the ideal shapes we encounter in acoustics books ? Ideally a loudspeaker should have the SPL response of a highpass system: a smoothly rising curve reaching a flat level at high frequencies. The physical effects that occur on a loudspeaker driver are too many, all compromising this ideal curve. It is essential to put them in order so that we understand all the factors that degenerate sound quality. It is also very important to know what sort of accuracy is furnished by each loudspeaker model and which model suits our discussion every time. A loudspeaker is not an ideal (point) source emitting waves of the same SPL level towards all directions. The very first model of sound radiation from loudspeakers was that of a vibrating rigid circular piston mounted on an infinite baffle (wall). Its mathematical simplicity allowed physicists to derive formulas for all sound quantities involved. The presence of an infinite (or just very large) baffle around the loudspeaker confines sound propagation to what-we-call semispace. Emitted sound waves take the shape of semispheres travelling away from the loudspeaker. Their SPL level is double the level they would have in the case of an unmounted loudspeaker radiating towards all directions. We say that an infinite baffle creates a radiation environment known as "2-pi semispace". A loudspeaker freely suspended in air radiates in a "4-pi space". The behaviour of an ordinary hi-fi speaker with a finite enclosure is obviously somewhere in-between. This issue remains complicated and we discuss its properties in the next tutorial article. -Is the rigid piston a good model for a loudspeaker? No, it is not. But it was used by physicists to simulate the complex addition (or superposition) of pressure waves emitted by all small parts of the circular piston area. Observation points in space receive these elementary waves at different instants and with different "phase". As a result this superposition is not really a perfect addition: the overall SPL response may have a drop at some frequencies. Real-world loudspeakers are not point-sources and as such they produce weaker SPL levels at various points in space. The strongest SPL levels can be gained at points on a loudspeaker's axis of symmetry. Points placed away from this axis get even weaker SPL levels. Next figure illustrates the whole idea for points in space at a distance of 1m away from the piston center of a 6.5'' woofer. An ideal point source (black line) would produce the same SPL level at all points in space (at a distance of 1m) either on- or off-axis. 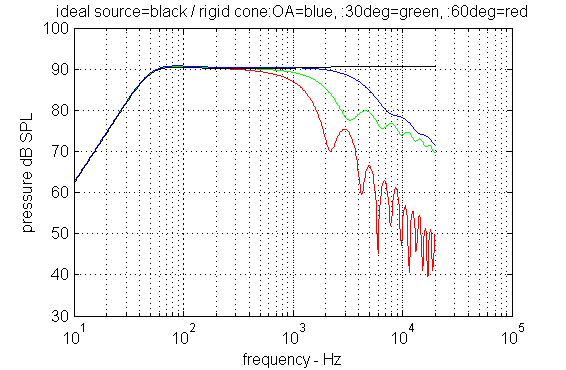 Blue line refers to the point in space that lies on woofer axis of symmetry (OA). We can not detect any difference at these frequencies. 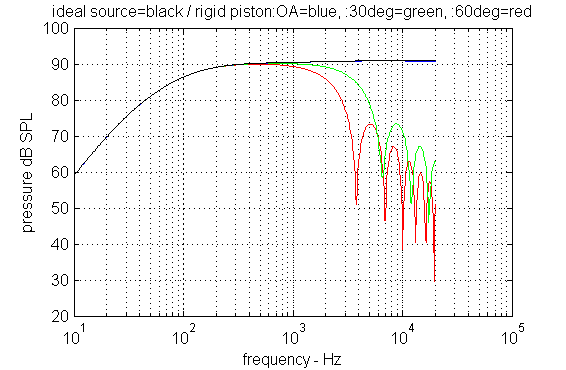 SPL response on-axis drops above 100kHz according to rigid piston model. We know that this is not true for real-world woofers. However it is interesting to note the green (30 degrees off-axis) and the red curve (60 degrees off axis) for the SPL response at points off-axis. Rigid-piston model predicts extensive SPL decrease. Experimental results confirmed these curves with a moderate degree of accuracy. Polar responses of wave sources are diagrams illustrating response changes as observation points move around the source in a circular sense. 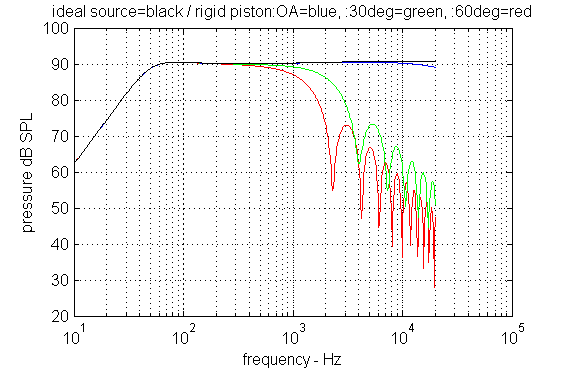 The following figure simulates the behaviour of the same 6.5'' woofer rigid piston model at various frequencies. We can easily observe that according to this approximation a 6.5'' woofer radiates the same SPL level at all directions at 1kHz. Strong off-axis radiation is confined in rather narrow angles . We deduce that loudspeakers become directive sources at higher frequencies. The rigid-piston approximation is a good start for engineers willing to study this directivity in an introductory level. - Does this directivity pattern hold for woofers of a different diameter? 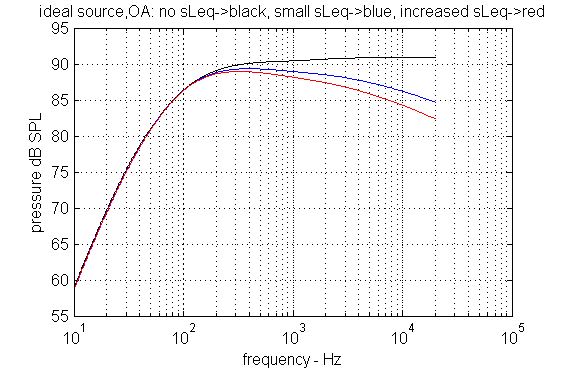 SPL level at 1kHz decreases off axis much more that in the 6.5'' woofer case. 5 and 8kHz radiation is now confined to even narrower angles (lobes) around the axis of symmetry. That is very good for a designer wishing to construct a speaker that does not radiate annoying frequencies towards the sidewalls of a listening room. We know that the irritating 'sh' of a singer's voice (or of a big classical choir) is concentrated in the range of 8kHz. So we better not send it to off-axis reflecting surfaces; otherwise a trained listener will complain for our speaker's performance. Figure above provides a comparison of a 6.5'' rigid cone to an ideal point source. Blue curve predicts a roll-off at high frequencies even for observation points on-axis (OA). This is quite true for all loudspeakers even if this model's accuracy is not very good: a real-world 6.5'' woofer presents a rather different SPL response above 6 kHz on-axis. -So what is next in loudspeaker modelling with respect to sound radiation on- and off-axis? Simulating the rise of a loudspeaker's impedance due to voice-coil inductance is not really as easy as electrical engineers might think. A voice-coil is not an isolated (and still) coil similar to ordinary inductors used in electronics. It vibrates close to metal assemblies flown by eddy currents. In short a special model has been defined in loudspeaker industry for this purpose, called semi-inductance. Semi-inductors have a peculiar behaviour.. It seems that everything is complicated in real-world loudspeakers! Figure above depicts the case of low and high semi-inductances in a loudspeaker example and their final impact on SPL response. The second and more important factor which is actually responsible for SPL response anomalies (resonances and dips) at high frequencies, is the fact that a loudspeaker cone does not vibrate with the same velocity at all its points. 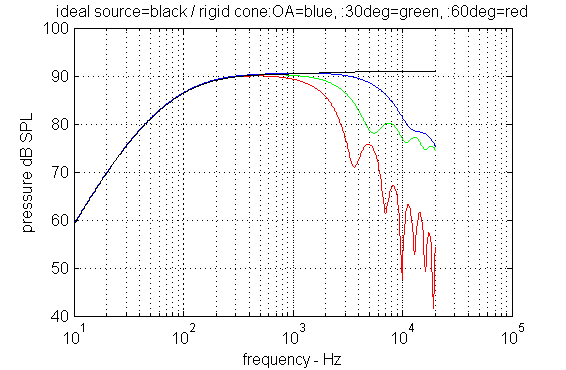 A loudspeaker cone is not a rigid-piston or cone as assumed by the associated models. Accurate loudspeaker modelling can only be achieved if we combine cone-geometry and voice-coil semi-inductance with the knowledge of the way vibration velocity changes at every part of the cone area. Lab measurements employing laser optics have proven that loudspeaker cones behave more or less as rigid surfaces at low frequencies with a constant velocity profile along their radius. Mathematical analysis has revealed that as frequency increases the outer part of a loudspeaker cone forms a ring at which a bending wave can be formed. Every instant some parts of this "ring" oscillate outwards and some parts inwards. If we study the SPL response of this ring as an isolated portion of cone radius, we will notice that it actually creates small SPL values with resonances and dips; what we call response anomalies. If frequency is further increased this wavy-ring becomes bigger (as a portion of cone radius). The area of the rigid-cone part decreases. So does the loudspeaker's SPL response too. Figure on the right depicts a typical woofer driver with a cone-shaped diaphragm made from a non-rigid material. Below a specific frequency limit (ftb) the whole area of the vibrating diaphragm maintains an almost uniform oscillation velocity. To identify the part of the cone that vibrates in a generally uniform way we use the sepia color. For a polypropylene 6.5'' woofer with a 39mm voice-coil this frequency limit is approx. 1710Hz. Above this limit bending waves start to build up at the outer rim of the cone. Figure on the left hand illustrates the whole idea: When frequency exceeds the ftb limit a ring on the outer rim of the cone starts to form bending waves. Now a smaller part of the cone (sepia color) maintains its uniform oscillation profile. As frequency increases bending waves populate even larger part of the cone (figure on the right hand). Distortion increases rapidly at these frequencies. Driver's SPL response exhibits resonances and dips. When frequency reaches another limiting value (fta) all cone area is subject to what we call bending-waves. No part is left for rigid-behaviour. SPL response has dropped severely : this is apparently the end of the operating frequency range of this loudspeaker. For the same 6.5'' woofer upper frequency limit fta lies at 5260Hz. Serious loudspeaker manufacturers try to control the formation of bending waves and the respective frequency limits by using stiffer materials and carefully selected cone geometries. On the other hand material internal damping provides very good suppression of resonant frequencies associated with bending wave effect. We understand that cone design is actually a science by itself, if high fidelity is to be served. Excellent animation clips that visualize the overall effect can be found on PACsys Ltd website. Don't miss it! At 1900Hz you can clearly observe the outer one third of the cone radius to surrender itself to bending waves. - Do we wish to operate woofers with bending waves on their cones in high fidelity sound reproduction? No we don't. Either the manufacturer has ensured adequate cone material damping that suppresses several resonance frequencies above ftb or the speaker designer has a lot of work to do to use his crossover cutoff skills.